In 2016, 86 percent of B2B marketers reported using content marketing, but only 32>percent had documented strategies. In our own research in 2017 about fashion marketing, we found that 45% of fashion marketers had documented strategies. What's more, the marketers with documented strategies were the ones who saw the best results. 72% of successful marketers agree with having a documented strategy and KPIs, while only 13% of unsuccessful marketers say they have a strategy in place. This is not so surprising. For a tactic to be successful, there simply needs to be a roadmap for success. If you fall into the group without one, there are many valuable resources to save you some time. Here are 14 free templates to help. If you don’t have a clear idea of what you want to accomplish with your content, this template can help. Content Marketing Institute's Core Content Strategy Statement Template puts your strategy into words, mad-libs style. The Core Content Strategy Statement addresses three key components of content strategy: company goals, buyer persona, and audience needs. Utilize this statement to guide content ideas, and use the grid below to analyze whether your ideas are a good match. AXZM has prepared what it calls “The Super Awesome Content Strategy Worksheet” - a pretty accurate claim, you'll come to find. HubSpot teamed up with Smart Insights to produce the SMART Marketing Goals Template. It covers four steps to creating an effective content marketing plan (whether for your clients or your business). Use the template to develop a plan for improving content marketing efforts, define objectives and KPIs. Brainstorm content ideas, map them across the funnel, and create a set timeline for your plan. Shape+Sound’s content marketing planning template is perfect for startups in early planning stages. It's very useful for B2Bs or companies with longer, complex sales cycles. A huge benefit to this template is that it addresses both buyer stage and buyer consideration -- crucial details in content planning. Even more mature companies may be targeting their buyers all wrong. The template is not downloadable (sorry), but there are step-by-step guidelines for using it in the link above. The Content Marketing Matrix is meant to guide your brainstorming efforts. It is structured to help you think through different aspects of various types of content based on how your audience may react and what you want to achieve, (i.e., what works best for an audience that’s more prone to impulse buys?). The matrix offers a great starting point for this planning. Chapter 6 of QuickSprout’s Advanced Guide to Content Marketing is a truly invaluable resource for your content planning and production. Each template comes with a how-to guide for using it and examples of what the end result should look like. Pam Moore created a fantastic editorial calendar template that breaks things down by monthly and weekly theme, blog post title, target audience, author, editor, due date, purchase cycle, and more. It also includes space for supporting images and media elements, embed content, syndication, and a worksheet to content inventory tracking. Here's an excellent resource for those in serious need of organization. It includes spreadsheets for a content audit, keyword matrix, content gaps, keyword research, and more. The Content Audit tab tracks URLs, actions to take (like whether to improve, remove or keep as-is), search metrics, conversions, and more. It is helpful for identifying potential patterns in the content and guiding overall strategy. The Keyword Matrix tab tracks URLs for pages that rank - or are most qualified to rank - for important topics. It essentially matches up keywords with the best possible page to guide your copywriting and optimization efforts. The Content Gaps tab includes content ideas for high-volume, relevant keywords in which no appropriate page currently exists. The involves content that has been overlooked. This is useful for new/small sites. The Keyword Research tab tracks keyword ideas gathered from other sources, such as the AdWords Keyword Planner. It is helpful for tracking keyword progress. Any serious content marketer has a documented social media strategy, too. This template will guide you through the proper steps for developing one. Hubspot’s Social Media Content Calendar will help you better manage your social networks and organize and plan social media activities far in advance. There is also useful information for how to format content for Facebook, Twitter, LinkedIn, Pinterest, and Google+. The monthly planning calendar gives an overall snapshot of monthly social media campaigns. Fill it in at the same day and time every single week to prep for the following week's social media content. A key part of any social media marketing plan is the social media audit. A social media audit assesses how well your current social media use is working for you. The template helps you execute a social media audit for your business in six steps. Influencer marketing is great for amplifying content reach and brand exposure. The Content Marketing Institute’s Influencer Marketing Template is an awesome resource for this. Organize and rank potential influencers, and easily track individuals' social reach and other info to determine whether they're a good fit for the brand. Keep track of companies you may want to reach out to, too, and the success of your efforts. The template is just a piece in a larger, more complete marketing budget template that includes Public Relations, Events, Advertising, Branding & Creative, Website, Personnel, and Product Marketing. Content Harmony created content marketing budgets for the "soloprenuer," small business, growth startup, and enterprise company. The examples break down the potential costs associated at each level. The great folks at Venngage created a comprehensive approach to benchmark how your content is performing. They put together a complete guide and multiple templates to help you measure your own marketing performance. It requires some work on your end but the guide and templates should help you tremendously. 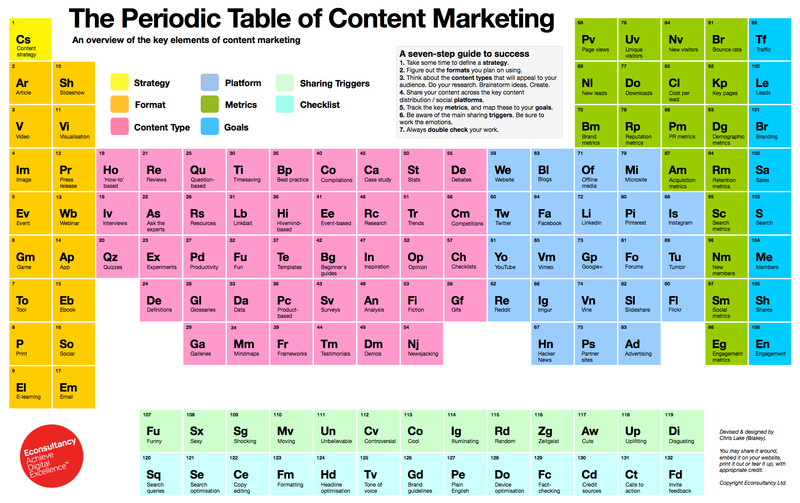 Econsultancy’s Periodic Table of Content Marketing. ClickZ’s Killer Content Marketing Campaign Template. Smart Insight’s SEO Content Strategy resource page. Buffer’s The 10 Best Copywriting Formulas slideshow. What are your favorite content marketing templates?